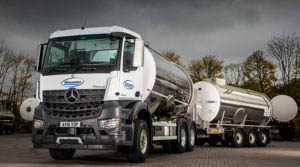 Wincanton, the largest logistics company in the UK, has ordered 100 new Actros tractor units from Mercedes-Benz as a part of its expansion plans. The new vehicles are fitted with the latest Mercedes-Benz safety systems including Active Brake Assist 4, which has the capability to recognize a pedestrian stepping out from behind a parked car and apply the brakes automatically. Proximity Control Assist prevents the vehicle from getting too close to vehicles ahead, and when combined with cruise control it can maintain a set distance to the vehicle in front, reducing stress and increasing comfort particularly in heavy traffic. The new Actros tractors are scheduled to be delivered to Wincanton by the end of January, and will see the firm’s fleet pass 3,400 vehicles in total.